Markets came under pressure last week, but held up very well. The recent lunar red period produced a 27 points gain in the Nasdaq, which means the market continues to display strength. Another push higher is in the cards with a new lunar green period now underway. The recent lunar red period has given us some sideways action, with the S&P failing to get above the 1700 level. 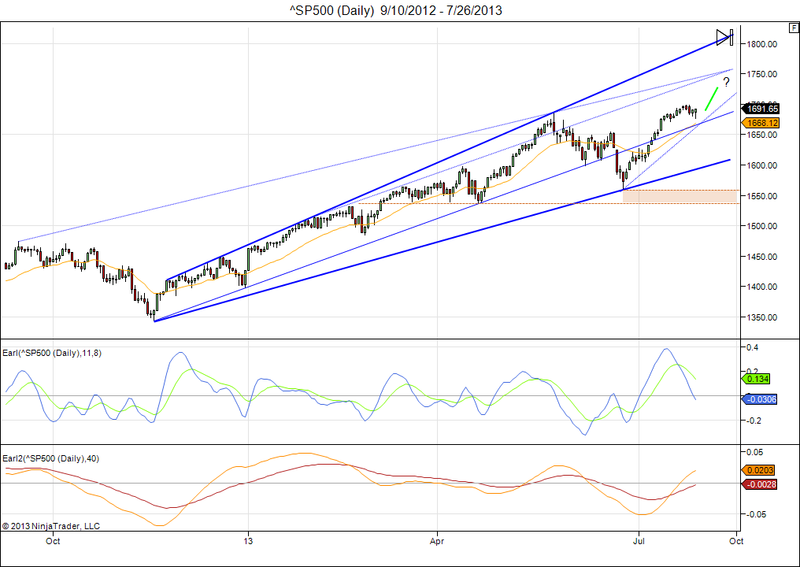 Important support for the S&P is around 1670. So, a close below that level would force us to reconsider this bullish scenario. Going forward, the area around 1550 is likely to become an important level to watch when we get the next major correction, as we eventually will. The 1550 area has been tested throughout the first half of this year, and also corresponds to the 2007 highs. Interestingly, a peak near 1750 would put the 1550 level exactly at the halfway point of the rally that started at 1350 last November. I think the coming months are going to be very interesting. 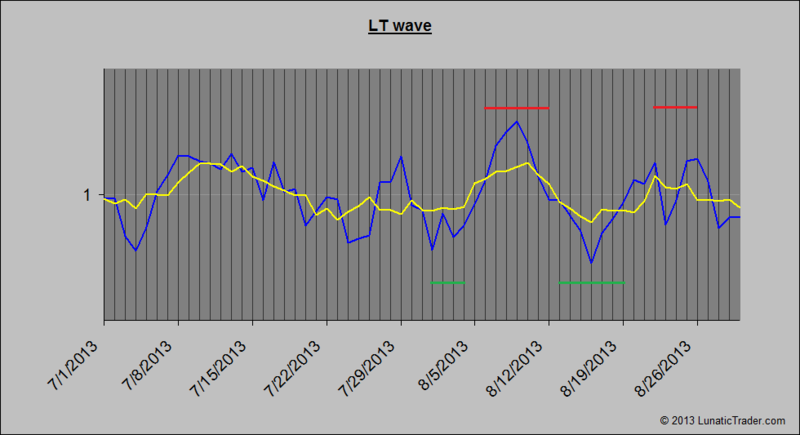 Today I will also share the LT wave chart for August. Last month’s version did reasonably well. The strong period going into mid month has clearly panned out. But, the expected weakness in the second half of the month has only produced some sideways action. The chart suggests some weakness in the first days of August, followed by a strong period until August 12. If we are to peak in August, then the days around August 10 are our first pick. Then there is expected weakness around August 16, followed by another potential peak around August 24. So, if we approach S&P 1750 in either of these peak periods, then I would take it as a signal to sell. This entry was posted on July 29, 2013 at 9:09 am	and is filed under Financial Astrology, Market Commentary. Tagged: LT wave, Nasdaq, S&P 500. You can follow any responses to this entry through the RSS 2.0 feed. You can leave a response, or trackback from your own site.